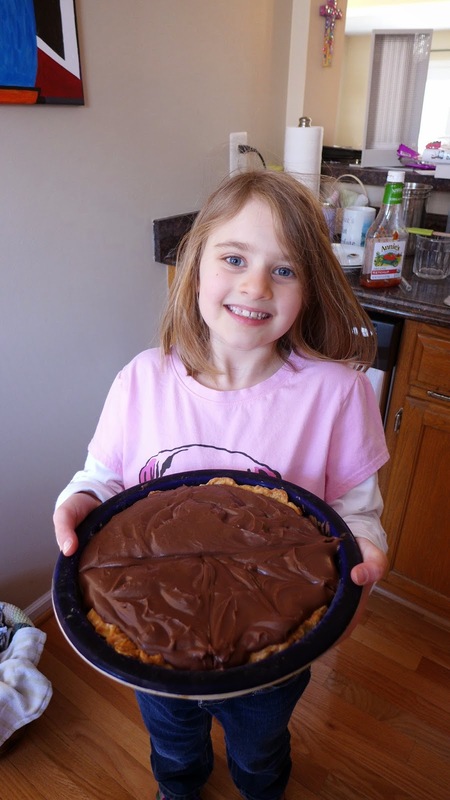 Feeding Our Lives, LLC: Pie (pi) Day: Chocolate Pie Recipe! Pie (pi) Day: Chocolate Pie Recipe! 1. It's celebrated by eating pie!!! 2. It's a super-fun way to teach geometry rules, including the what the heck pi is. 3. If you celebrate it with other people, it's great at showing kids (and adults) that learning about math is "cool." In years past, we've gone to my husband's office to eat pie with his co-workers. This year, our homeschool park day was on pi day so we got to celebrate the event with friends! Before going to park day, we made a pie and learned about pi! I will have you know, I did not know what pi was until last month. I knew it as a constant number: 3.14...... and when you use it. BUT, I didn't know what it actually was or how it was derived. Now, I'm in the know, and I got to do a fun hands-on lesson of it with my daughter and her friends! Homeschooling is great: I learned something, the kids learn something, and we get to eat pie! Oh, you probably want to most awesome pie recipe ever......well, unfortunately, it's not my recipe, so I'm going to have to send you over to King Arthur to get the recipe for the the Best Ever Chocolate Cream Pie!!! I've made this pie at least 6 or 7 times over the past few years, and it has turned out perfectly ever time! It's got amazing chocolate flavor and it silky-smooth.